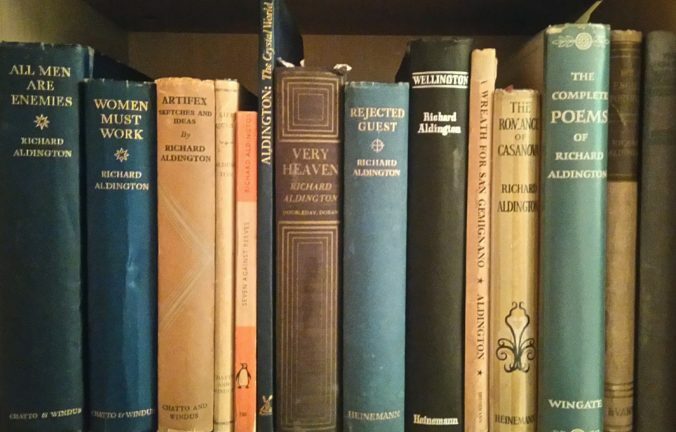 Part of my Richard Aldington collection. In the course of an academic career, you tend to become associated with particular ideas, topics and authors. This can often happen in part by chance – being in the right place at the right time. As many of you will know, my main research interest is in the First World War. It’s what I wrote my PhD on, and my monograph, along with all sorts of other publications. In this and a subsequent post, I want to point you to a couple of authors who might not be familiar to you, but who I’m interested in, have worked on quite a bit, and am involved with author societies or other means of promoting their legacy. Richard Aldington has become a figure I’ve returned to throughout my academic career, since writing about him for my MA thesis (now longer ago than I would prefer to think about). He’s probably still best known as one of the original Imagist poets, along with H.D. (who was for a time his wife) and Ezra Pound; much of his poetry is available online for free at archive.org. I was particularly drawn, though, to his First World War novel Death of a Hero (1929). Angry, bitter, and sharply critical of the British literary and political establishments, Death of a Hero is a satire so brutal that it is often misunderstood. Aldington’s position, though, was that the brutality of the war should be matched by the form of writing about it. For him, to write in a polite and measured way about the conflict was fundamentally to misunderstand and misrepresent the experience of it. I’ve recently written an overview of his war poetry Images of War (1919) and Death of a Hero for a forthcoming Handbook of British Literature and Culture of the First World War. Death of a Hero was so confrontational and shocking that it was originally expurgated – Aldington worked with his editor at Chatto & Windus to remove sections that were thought likely to be unacceptable to a contemporary readership. The removed words, sentences and sections are indicated in the text by asterisks as Aldington wanted the reader to know where emendations were made. Sadly, the recent Penguin republished the expurgated text, which I thought a missed opportunity to demonstrate the vitality of Aldington’s prose; I’d recommend looking out for the unexpurgated version, which you’ll find in most 1960s paperbacks (published by Four Square and Sphere) and the 1980s Hogarth Press edition. 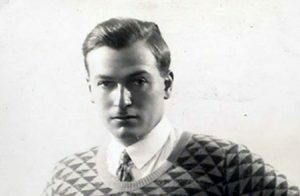 For information about Richard Aldington, you can look at the New Canterbury Literary Society Newsletter. Originally founded as a paper newsletter by the late Aldington scholar Norman T. Gates, I’ve recently “rebooted” it as a blog. Please do let me know if you read any Aldington and want to talk about it some more!